I can see the Blue Moon from my balcony in the Villa Linda in Giardini Naxos tonight. Earlier in the evening, after sunset, I strolled along the beach in Recanati, to see the moon rise slowly above the horizon and scatter its sparkling reflections across the waters of the Ionian Sea. Earlier in the afternoon, after coming down Mount Etna, there were patches of dark clouds across parts of the east coast of Sicily and the thunderstorm lasted for about half an hour, with flashes of lighting across the water. None of this deterred nor disturbed swimmers or paragliders, and life at the beach went on as normal. Italian weekenders have arrived here in large numbers, and families were still on the beach, enjoying the late July heat, after sunet. But as I watched, I wondered how many people realised that the rising moon tonight is a blue moon. This blue moon is the second full moon this month and the first Blue Moon since August 2012. Every month has a full moon – apart from a very exceptional February – and the word month itself is derived from the word moon. But a Blue Moon happens only once every three years or so because the lunar calendar and the solar calendar are never the same. Of course, the moon tonight does not look blue at all … the phrase has nothing to do with the actual colour of the moon. When the moon has a bluish hue, it is because of smoke or dust particles in the atmosphere. But Mount Etna, which I climbed earlier today, has not erupted this evening. When the phrase “once in a blue moon” was first used, it meant something so rare you or I would be lucky – or unlucky – to have seen it in our own lifetime. So, where does the term comes from? In calculating the dates of Lent and Easter, the early Church identified a Lenten moon. Sometimes, February, with only 28 or 29 days, has no full moon. So, when the full moon arrived too early, the early moon was called a betrayer or belewe moon. The earliest recorded use of the term Blue Moon in English is found in a pamphlet attacking Rome and Cardinal Thomas Wolsey, written in 1528 by two Greenwich friars, William Roy and Jerome Barlow. There is not going to be another Blue Moon again for another few years. Where shall I be then? Listening to the bells of the cathedrals in Taormina, Suracuse or Noto during this week in Sicily, or visiting the Palazzo Corvajo in Taormina, I am reminded of the Sicilian Vespers (Vespri Siciliani) and the slaughter associated with it – a story I first read about in detail in the magisterial book of the same name by the late Steven Runciman (1903-2000), one of the greatest Byzantine scholars. The Sicilian Vespers is the name given to a popular revolt that broke throughout Sicily in Easter 1282 against the rule of the French-born king, Charles of Anjou, who had ruled Sicily since 1266. Within six weeks, 3,000 French men and women and Charles I and his Angevin government lost control. It was the beginning of the War of the Sicilian Vespers. The rising had its origin in the struggle over the control of Sicily between the House of Hohenstaufen, which then ruled Germany, and the Papacy and the Papal States. In 1245, Pope Innocent IV tried to depose the Emperor Frederick II. In 1255, Sicily was seized by Frederick’s illegitimate son, Manfred, who ruled from 1258 to 1266. Both Pope Urban IV and Pope Clement IV excommunicated Manfred and then tried to depose him. At first the crown of Sicily was sold by the Pope to Henry III of England, who accepted it on behalf of his eight-year-old son, Edmund ‘Crouchback’ or Edmund of Lancaster (1245-1296), who was styled “King of Sicily” for ten years. But in those ten years, England never paid any rent to the Pope, and “King Edmund” never set foot on Sicily. Urban IV then deposed Edmund, and made Charles of Anjou (1227-1285) the King of Sicily, on condition that he paid the accumulated English debts to the Pope. 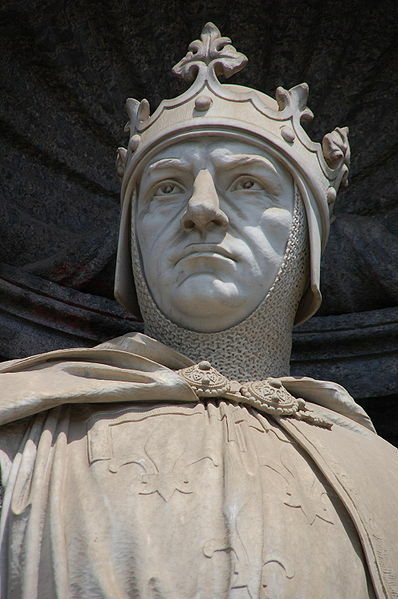 Charles, who was the younger brother of King Louis IX of France, imposed heavy, punitive taxes on the people of Sicily to pay the debt he had acquired. But he was even more ambitious than many realised, and had plans to capture Constantinople and to overthrow of the Emperor of Byzantium, Michael VIII Palaeologus. But Sicily was never a happy part of the Angevin empire, the resident nobility had no voice in government and heavy taxes were imposed on the island to pay for Charles’s wars outside Sicily. Byzantine agents in Sicily worked to undermine Charles’s plans and projects, and found a voice in Manfred’s son-in-law, King Peter III of Aragon, who regarded his wife Constance as the rightful heir to the throne of Sicilian throne. The revolt known as the Sicilian Vespers began when the bells rang out in the Church of the Holy Spirit, Palermo, at the start of Vespers, the sunset prayers on Easter Monday, 30 March 1282. According to Runciman, the Sicilians at church that evening were taking part in the holiday festivities when a group of French officials came in and began to drink. A sergeant named Drouet dragged a young married woman from the crowd, pestering her with his advances. Her husband attacked Drouet with a knife and killed him. When the other Frenchmen tried to avenge their comrade, the Sicilian crowd fell upon them, killing them all. At that moment all the church bells in Palermo began to ring for Vespers. To the sound of the bells, messengers ran through the city calling on the men of Palermo to rise against the oppressor. At once the streets were filled with angry armed men, crying “Death to the French” (“moranu li Franchiski” in their Sicilian dialect). Every Frenchman they met was struck down. They poured into the inns frequented by the French and the houses where they dwelt, sparing neither man, woman nor child. Sicilian girls who had married Frenchmen perished with their husbands. The rioters broke into the Dominican and Franciscan convents; and all the foreign friars were dragged out and told to pronounce the word “ciciri,” whose sound the French tongue could never accurately reproduce. Anyone who failed the test was slain … By the next morning some two thousand French men and women lay dead; and the rebels were in complete control of the city. In a different account of events, written in 1416, Leonardo Bruni says the people of Palermo were holding a festival outside the city when the French came to check for weapons, and on that pretext began to fondle the breasts of their women. This then began a riot. The French were attacked first with rocks, then weapons, killing them all. The news spread to other cities leading to revolt throughout Sicily. Messina was well fortified, and there the leading family, the Riso, remained loyal to Charles. But on 28 April it too broke into open revolt and in the harbour the people set fire to the Angevin fleet in the harbour. Within six weeks, thousands of French people had been massacred in Sicily. The only place in Sicily not to join the uprising was the small village of Sperlinga, which protected French soldiers in the castle. After order was restored in Palermo, the citizens proclaimed a free commune answerable only to the pope. They elected leaders, including Bartholomaeus of Neocastro who gave his own account of the revolt in his Historia Sicula. A Genoese merchant, Alafranco Cassano, brought news to the Emperor Michael that Charles had been defeated. Ambassadors were sent to Pope Martin IV with a petition for each city in Sicily to become a free commune under the sole suzerainty of the Church. Perhaps each city was hoping for a status similar to that of Venice, Genoa, Pisa or other free cities throughout Italy. However, the Pope was French and continued to support Charles as the rightful King of Sicily. But he underestimated how the Sicilians hated the French and especially Charles, and refused the islanders’ pleas. The Sicilians then sent for King Peter III of Aragon, whose wife Constance was the sole surviving heir of Frederick II who was not in captivity and in a position to assert her rights. Through his wife’s position, Peter III now claimed the Kingdom of Sicily. He had assembled a war fleet off the north coast of Africa in Tunis, 200 miles by sea from Sicily. Taking advantage of the revolt, his fleet sailed for Sicily, landed at Trapani on 30 August 1282, and he marched on Palermo, arriving on 2 September. Pope Martin ordered the people to accept Charles as their king, but Peter countered with a promise to guarantee their ancient privileges. Peter was crowned King of Sicily by acclamation in the cathedral in Palermo on 4 September, becoming King Peter I of Sicily. Charles counter-attacked with his fleet based in Naples. He blockaded the port of Messina, but failed in his several attempts to land troops on the island. As for Edmund Crouchback, the English boy-king who never set foot on Sicily, he died at the Siege of Bayonne died on 5 June 1296; his body was brought back to England, where he was buried in Westminster Abbey. Eventually, the House of Lancaster claimed the throne of England in the War of the Roses, and he was the ancestor of Henry IV. In the Divine Comedy, Dante sees Charles of Anjou outside the gates of Purgatory “singing in accord” with his former rival, Peter. After 1282, he is usually known as King of Naples. He proclaimed himself King of Albania in 1272 and by purchase he became King of Jerusalem in 1277. He died on 7 January 1285. For centuries, the Beaumont family, who inherited Wednesbury Manor in Staffordshire and passed it though marriage to the Comberford family of Comberford and Tamworth, claimed they were descended from Louis, son of Charles of Anjou. The War of the Sicilian Vespers between Anjou and Aragon continued for decades, but was more often waged in Spain or on the sea than in Sicily. The War of the Sicilian Vespers finally came to an end in 1410. After the death of Martin II, a group of Aragonese nobles gathered in the so-called Sicilian “parliament” in the Palazzo Corvaja in Taormina to choose the next King of Sicily. Sicily was placed under direct Spanish rule, and remained a Spanish controlled island, apart from a brief period of Habsburg rule in the early 18th century, for 450 years until Italian unification in 1860. Steven Runciman, The Sicilian Vespers: A History of the Mediterranean World in the Later Thirteenth Century (Cambridge: Cambridge University Press, 1958). I had promised myself that this week I would explore Giardini Naxos and the site of Naxos, the earliest Greek settlement in Sicily. But it became a busy week, with visits to lofty hill town of Taormina, which stands high above Giardini Naxos, and later in the week to the classical sites in Syracuse and Noto with its grand baroque architecture. After two walks on the beach at Recanati yesterday [30 July 2015] and along the shoreline, I went in search of the classical city of Naxos, which is behind a railed site east of Recanati. But it was a long walk around the site and through the resort of Giardini Naxos before I found the entrance to the archaeological site and museum beside La Sirena restaurant on the busy seafront, on the low, rocky headland now called Cape Schisò. It is hard to imagine with these few scanty remains that this was once an important centre of Greek civilisation and culture on the island of Sicily, and remained so until the Arab invasions of the Byzantine Empire. Classical Naxos stood on Cape Schisò, formed by an ancient stream of lava, immediately to the north of the Alcantara, one of the great gorges in Sicily. A small bay to the north separates in from the foot of the hill-top town of Taormina. Classical writers say Naxos was the most ancient Greek colony in Sicily. It was founded a year before Syracusae (Syracuse), or in 735 BC, by a group of colonists from Chalcis in Euboea and the island of Naxos in the Cyclades. The leader of the colonists and the founder of the city was Theocles or Thucles, who was born in Athens. But the name of Naxos is derived from the presence among the original settlers of a group of colonists from Naxos. The new colony must have been speedily joined by fresh settlers from Greece. Six years after it was established, the Chalcidians at Naxos were able to send out a fresh colony to set up the city of Leontini (Lentini) in 730 BC, followed soon by another colony at Catana. Strabo also speaks of Zancle (modern Messina) as a colony from Naxos, although Thucydides does not mention this. Callipolis was another colony of Naxos, although the site is not known. Surprisingly, we know little about the early history of Naxos, and the first accounts are about disasters that hit the Greek city. Herodotus recounts that Naxos was besieged and captured by Hippocrates, the despot of Gela, ca 498-491 BC. Soon after, Naxos was in the hands of Gelon of Syracuse and his brother Hieron by 476 BC. In a move to strengthen his own military power, Hieron moved the people of Naxos and Catana to Leontini, and brought in new Greek colonists to live in the cities he had emptied. However, Naxos was restored to the original inhabitants in 461 BC, and the cities of Naxos, Leontini and Catana formed a close alliance against Syracuse and the other Doric cities in Sicily. When Athens sent a force to Sicily under Laches and Charoeades, Naxos immediately came to its aid. In the war that followed, Naxos repulsed a sudden attack from Messina in 425 BC. During a later expedition from Athens to Sicily, the Athenian fleet landed at Naxos in 415 BC, and Naxos once again fought on the same side as the Athenians. Thucydides recalls that Naxos and Catania were the only Greek cities in Sicily that sided with Athens. A revenge attack on Naxos by Syracuse was called off in 409 BC because Carthage was posing a military threat to all the Greek cities in Sicily. But in 403 BC, Dionysius of Syracuse captured Naxos which was betrayed by the general Procles. Dionysius sold all the inhabitants of Naxos into slavery, razed the city walls and buildings, and handed over the defeated city’s territory to neighbouring Siculi. Naxos never recovered from this blow, and it is difficult to trace what happened to the place in the immediate aftermath. But a new settlement was built on the hill called Mount Taurus, which rises immediately above the site of Naxos ca 396 BC, and this eventually became the town of Tauroménion (Ταυρομένιον), present-day Taormina. In 358 BC, Andromachus, the father of the historian Timaeus, gathered together the descendants of the people of Naxos, by now exiles throughout the island, and brought them to live on the hill of Tauroménion, which became the successor of ancient Naxos. Pliny the Elder is mistaken when he says Tauroménion was once called Naxos. The new city quickly prospered, and the site of Naxos was never fully resettled. However, the altar and shrine of Apollo Archegetes continued to mark the spot where Naxos once stood, and it is mentioned in the war between Octavian and Sextus Pompey in Sicily in 36 BC. It remained a tradition for all envoys setting out on sacred missions to Greece, or returning to Sicily to stop at Naxos and offer a sacrifice on the altar. The site stretches over a large area of Cape Schisò, among olive and lemon groves. It is badly labelled, but it is possible to make the foundations of a once-large town laid out in grids and a long stretch of the city wall of Naxos, as well as rubble indicating the later presence of a Byzantine town on the site. For centuries, the Schisò Castle belonged to the De Spuches family. It is still private property and is not open to visits or for archaeological research. It may date back to 1100. It has a square plant and four round towers and is surrounded by a large garden. The castle had an autonomous supply of water thanks to a well immediately outside. Underground passages connected to the Vignazza Tower, an impressive defence garrison on the promontory of Naxos, and to another small fortress east of the castle. Inside the Schisò Castle is the small Church of Saint Pantaleo, a martyr who was a missionary in Roman Sicily (feast day 29 July). During the Arab occupation of Sicily, Naxos was called al-Kusus. In the Norman period, Kusus became Kisoi and then Schisò. Since the area was widely cultivated with citrus orchards, it came to be known as Giardini and was part of the administrative area of Taormina. In 1005, Queen Adelasia, the wide of Count Roger of Altavilla, gave the Church of Saint Pantaleo at Schisò to monks following the rule of Saint Basil, granting them the right of tax-free fishing in the sea off Naxos. Schisò Castle may date back to 1100. For centuries, the castle belonged to the De Spuches family. It remains private property in the hands of the Palladino family and is not open to visits or for archaeological research. It has a square shape and four round towers and is surrounded by a large garden. The castle had an autonomous supply of water thanks to a well immediately outside. The towers and castles on the cape helped to protect the Sicilian coastline along the Ionian Sea against corsairs and pirates from the north African coast, and the raids did not cease until France conquered Algiers in 1830. In 1846, King Ferdinand II transformed Giardini into an independent commune. The economic development of Giardini Naxos started around 1870 after the Messina-Catania railway opened and changed the small maritime village into a popular tourist destination. However, the site of Naxos has never been fully excavated by archaeologists, and some of the small number of pieces recovered are on display in the small two-room museum.